How do you make artistic inspiration pay the bills? Crescent School alumni working in creative fields share their insights in the latest issue of Past & Present, Crescent's alumni magazine. Musicians Chris Luedecke ’94, Chris Beck ’87 and Jason Beck ’89, and photographers Gordon Von Steiner ’06 and Jake Graham ’09 have very different careers but share a lot in common as they balance their artistry with business skills. The issue also includes a profile of Michael Yan ’05, who is making strides in the green energy sector as the co-founder of Heliolytics, and expert advice from journalist Evan Solomon ’87 and travel specialist Greg Sacks ’91. Other highlights include an interview with retired teacher Doug Smith and news about current teacher Michael Jansen’s Certificate of Achievement from the Prime Minister’s Awards for Teaching Excellence. 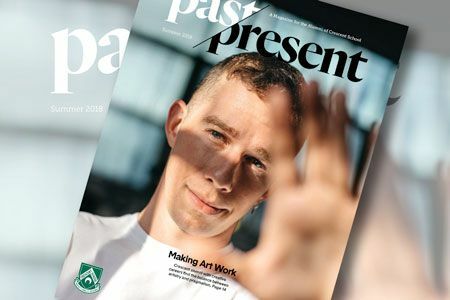 Click here to read the Summer 2018 issue of Past & Present online. Find more Crescent School publications here.